First Sign of Madness: Quadruple rainbow! A blog about life, music, maths, geekery, and stream of consciousness rambling. The first is that you can get two different paths of reflection of rays of light happening within water droplets, which gives us another "secondary" rainbow. The second is the effect of a body of water, usually behind the observer along with the sun, reflecting the sun - it acts just like another (though less bright) sun shining from a different location, and gives us another pair of rainbows. Because the second pair of rainbows is from another "virtual sun", the centre of the rainbow is in a different place so they're offset a bit from the first pair, hence the weird shapes. So, that makes sense. But there's water everywhere! Rainbows aren't that uncommon, and even double rainbows are seen occasionally, so why are quadruple rainbows so rare? I've never seen one, and I've seen plenty of double rainbows! First, the reason that we don't see rainbows all the time is that we need the sun to be shining behind you, and it to be raining in front of you so we have water droplets for the sunlight to reflect off. Often weather is one or the other - either all rain and clouds (hence no sun) or no rain. Also, if the sun is too high in the sky, a rainbow can't happen - a raindrop has to bend the light a certain amount (40-42° for a normal rainbow, 50-53° for a secondary one), so you can't have the sun and the reflections you need for a rainbow in the sky reaching your eye at the same time if the sun's elevation is more than 40° above the horizon. For a secondary rainbow it only needs to be less than 53° above the horizon, but the reflections are a lot weaker (the rays of light have to pass through the raindrop twice and bounce off the inside once) so it's a lot harder to see unless the conditions are just right. Here's a drawing from this site showing the path of light from the sun (yellow lines) at sunrise or sunset, and how they bounce off raindrops to create rainbows at the blue and red colours (these are reflected at different angles, hence the colours of a rainbow). The higher the sun in the sky, the more downward-pointing those yellow lines will be, and the closer to the horizon and harder to see the rainbow will be (to see the effect, tilt your head to the left and imagine the ground is still horizontal from your perspective). To get the other two rainbows, we also need to have a body of water the right distance away behind you (it's also possible in front of you, but more difficult) to create another "sun" that will also make two rainbows - this will already be more difficult because the reflected sun will be less bright depending on how good a mirror the water body is. We can work out a few things from this. First, the apparent height of the original and secondary rainbows (green) are never much larger than the distance the rain is away - the higher the sun is in the sky, the lower the height relative to distance. As the rain goes right to the ground, this doesn't really restrict us at all until the rainbow goes below the ground and we can't see it. However, for the reflected rainbows (black), it's the opposite - the higher the sun is in the sky, the higher we expect the raindrops to be, and they're almost always going to be at least as high as the rain is far away. We'd expect raindrops to usually be less than 6km high based on this site, so the rain should be closer than that at least. Using the timestamp in the Twitter post (changed to New York time, 5:57am) and this site, we can actually work out where the sun was in relation to New York when the picture was posted (and, hopefully, taken). It turns out it was not long after sunrise, so the sun was quite low in the sky at about 8.2° in height. The blue line on the graph represents this. The highest points of our secondary original rainbow (green, dotted) and our primary reflected rainbow (black, plain) should be at around the same place, with the original slightly lower, and this looks to be the case on the image. So far so good! Also the primary original (green plain) and secondary reflected (black dotted) are below and above these two. 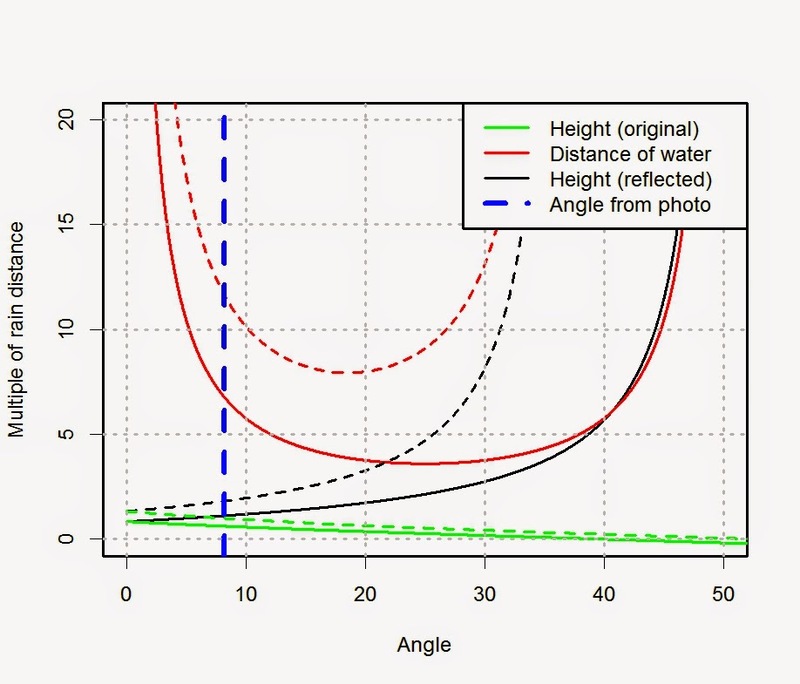 The next thing we need to check is if the water lines up - the water for the primary reflected rainbow should be about 7 times further than the rain, and the secondary reflected about 12 times further. The direction of the sun at that time of morning was about 81°, so just north of east. If we assume the rain was about 1km away, looking at the map of the location there are two likely-looking patches of shallow, calm water about 7km and 12km in that direction at Oyster Bay and Cold Spring Harbor respectively. So after doing some detective work, it looks like not only is the quadruple rainbow plausible, but the combination of a series of unlikely but very possible events! Hi! I'm an "ecological modeller" - basically, using numbers to try to help save the world :) In my spare time I like to do geeky things, play music, run, play ultimate frisbee and spend time with friends, family, my lovely and increasingly pregnant wife and our psychotic cats. Also I don't have a lot of spare time. I'm very tired.